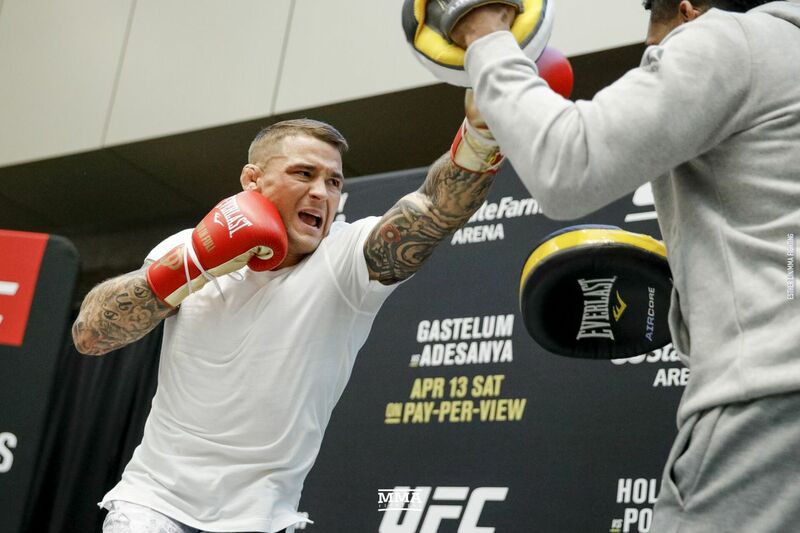 There will be two new champions crowned at UFC 236 and even though they’re of the interim variety, there’s hope that Saturday’s victors will bring some stability to their respective divisions. For Max Holloway, he enters his main event rematch with Dustin Poirier already knowing what it takes to be a UFC champion, having won and successfully defended the featherweight crown. What isn’t known is whether he’ll be able to avenge a seven-year-old loss to “The Diamond”, the only man to ever finish Holloway. Poirier has long been a contender at 145 and 155 pounds, but it has taken him 22 Octagon appearances to finally get a shot at gold. Also a longtime contender in two weight classes, Kelvin Gastelum gets his chance to earn a middleweight title six years to the day of his Ultimate Fighter 17 triumph that launched his UFC career. He was supposed to face undisputed titleholder Robert Whittaker in February, but emergency surgery spoiled that opportunity and Gastelum now meets Israel Adesanya for an interim belt. Adesanya has never tasted defeat in MMA and he can become the 10th fighter to win a UFC title with an unblemished record if he takes out Gastelum. No one knows for sure when we’ll see Khabib Nurmagomedov or Whittaker again, but until they return, the two men who walk out of UFC 236 with gold around their waste can make an argument that they’re the best in their respective divisions. In other main card action, Eryk Anders takes another crack at light heavyweight when he fights Khalil Rountree, Alan Jouban returns from 400-plus day layoff to fight Dwight Grant in a welterweight bout, and Ovince Saint Preux meets Nikita Krylov in a rematch of light heavyweight finishers. When: Saturday, April 13. The four-fight early preliminary card begins at 6:15 p.m. ET and will air on the ESPN+ and UFC Fight Pass streaming services, followed by a four-fight preliminary card on ESPN at 8 p.m. ET. The five-fight pay-per-view main card begins at 10 p.m. ET and is available for purchase exclusively through ESPN+. I don’t know if we’ve ever seen a better Dustin Poirier than we’ve seen in his last three fights against Eddie Alvarez, Justin Gaethje, and Anthony Pettis. And I still don’t know if that’s enough to beat Max Holloway. Yes, Poirier won their first meeting back in 2012 and he’s more than lived up to the promise of that initial encounter even as he’s fallen just short of championship opportunities. On the other side, “Blessed” has been an absolute force of nature and hasn’t lost a fight in five years. Even though Holloway has had the better results on paper (13 straight wins and a UFC belt ain’t shabby), it’s easy to see why this is looking like a fairly even matchup if both are at their best. Keep in mind, Poirier has won eight of his last nine (excluding the first Alvarez bout that ended in a no contest). If you want to give either fighter an edge, one could argue that Holloway has the better durability having never been KO’d and rarely even caught clean, which is a testament to his next-level striking. And all one has to do is look at his pair of bouts with Jose Aldo to see how he deals with a striker who has elite accuracy and finishing ability. Poirier doesn’t have to be better than Aldo, he just has to be better than Holloway on Saturday and frankly, if you matched these two up a hundred times you probably wouldn’t end up with a greater split in results than 60-40. If there were any questions about Poirier’s ability to keep pace with top contenders, he silenced them with late finishes of Gaethje and Pettis. This one will likely go to the championship rounds and Poirier is more than equipped to match Holloway step-for-step. Terrible fight to have to pick. Hell of a fight to get to watch. Here’s where I do that thing where I explain all the reasons why one fighter should win and then pick the other guy. As impressive as Israel Adesdanya’s rise through the UFC ranks has been, he really hasn’t fought an opponent on the level of Kelvin Gastelum yet. With the greatest respect to Anderson Silva, he is well past his prime and also someone I would consider a favorable matchup for Adesanya at this point in his career. Gastelum, on the other hand, is the blueprint for the kind of fighter that should be Adesanya’s foil. Explosive, fast hands, relentless wrestling. These are the traits that Gastelum brings to the table and if he had a few more inches of height and reach, the odds would probably be greatly in his favor. As it is, there’s enough reasonable doubt to think that the considerably longer Adesanya will be able to pick apart Gastelum from distance and frustrate him with his mystifying kickboxing. Adesanya also showed in bouts with Brad Tavares and Marvin Vettori that he can deal with adversity and is not just a front runner. And deal with adversity he must, because win or lose, Gastelum has been one of the most grueling matchups in the UFC since his days on The Ultimate Fighter 17. He simply does not let up and is dangerous in every phase of the game, especially as his boxing has developed to the point where his punching combinations have to be respected, even by an opponent with Adesdanya’s vast striking experience. On the ground and against the cage, Adesanya will have to be in escape and survival mode, while also preserving his energy. He went five rounds against Tavares, but Tavares is no Gastelum. Whether Adesanya can keep championship pace with Gastelum will be something to keep an eye on. Maybe it’s too soon to anoint Adesanya as the best 185er in the world, especially with undisputed champion Robert Whittaker waiting in the wings, but his brilliant and mature standup combined with his physical advantages should make him the best 185er in the Octagon at UFC 236. This is a somewhat odd booking for Eryk Anders given that as recently as last February he looked like an intriguing prospect at 185 pounds. His lone appearance at light heavyweight was an entertaining, if sloppy short-notice affair against Thiago Santos and it looks like Anders wants to give it another go with a proper training camp. He gets a solid matchup in Rountree, a powerful puncher with — to put it kindly — a limited ground game. Rountree wants to stand and for the most part when he’s had a willing dance partner, he’s been effective. He showed just how good he can be when he took out kickboxing star Gokhan Saki at UFC 226. Anders is a top-shelf athlete who has shown a propensity for brawling too, but he would do so here at his own peril. The former Alabama Crimson Tide linebacker has said on multiple occasions that he considers himself to have excellent jiu-jitsu and if that’s the case, he’d be well-served using this matchup to showcase it. I’m going out on a limb and predicting that Anders will be smart and surprise Rountree by taking him down and dominating on the ground. Alan Jouban has always looked the part of a contender with his thrilling striking style and one-punch KO power. His results haven’t always matched expectations, which is why he finds himself stuck in the middle of the welterweight rankings having to deal with UFC newcomers like Dwight Grant. A late bloomer with half as many fights as Jouban, it feels like Grant is just starting to scrape the surface of what he can do. He has good instincts in the counter-striking department and pop in his right hand, which will bring out the tactical fighter in Jouban. This fight could come down to who is able to establish the kicking game first and wear down the opponents legs. I favor Jouban slightly in that area. If Grant can avoid having his mobility diminished by low kicks, he can get Jouban chasing him, a scenario that has led to calamity for Jouban in the past. However, he also has to be wary of Jouban’s ability to close the distance and generate serious force in the clinch. Tough call here, but I’m liking the slightly fresher chin of Grant to give him the edge in a fight where both guys are going to do some damage. What happens when the unstoppable juggernaut meets the, uh, very movable object? Okay, so that’s not exactly the most accurate way to frame this second meeting between Ovince Saint Preux and Nikita Krylov, but the point is that the chances of this one going to the scorecards are essentially nil with “OSP” being the most prolific UFC finisher at light heavyweight not named Jon Jones and Krylov having never gone to the scorecards once in his 30-fight career. These two could get wild early and it wouldn’t be surprising at all to see Krylov catch Saint Preux with a head kick or a guillotine choke out of nowhere and end this in the opening minutes. But I tend to lean towards experience, especially with someone like Saint Preux, who has been in there for 25 minutes with Jones and also gone the distance with guys like Volkan Oezdemir, Ryan Bader, and most recently Dominick Reyes. He hasn’t always looked good in those fights, but at least we know he’s adaptable. Krylov, as fun as he can be, is just too unpredictable to have much faith in, and this should end with Saint Preux getting him down and tapping him out once again.